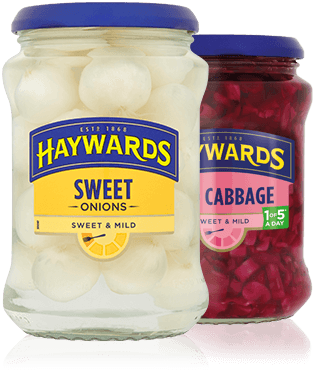 Haywards is the UK’s best loved pickled vegetable brand*, and perfect to liven up your food! With powerful flavours which create a cheek sucking, eye-popping sensation that can smack your taste buds squarely in the face! Haywards pickles offer a colourful treat with the ability to add a rainbow of colour to a plate! Haywards are the pickling experts and have been producing pickled vegetables since the 1800s. In 1868 the Haywards Brothers of Montford Place, Kennington, formed a company making pickles, sauces, vinegar and cordials. The company’s specialities included Military pickle, Military Sauce, old English pickles and Karjat chutney. In 1956, the Haywards trademark was sold to Edward Manwaring Ltd, where the brands amalgamated to form the Haywards brand. Following this in 1963, Haywards was bought by the Melbury group and then by Brooke Bond Oxo in 1970. In 1979 the company moved from London to Bury, where the factory is based today. In 1985 Brooke Bond was bought by Unilever and following further mergers and acquisitions, the Haywards brand was bought by current owners, Mizkan Euro, from Premier Foods in 2012. In October 2015, the brand was relaunched to offer a revived offering including delicious new recipes and exciting stand out packaging. The Haywards Tang-o-meter is a helpful way to navigate all of the flavours in the range. The Tang-o-meter displays our full range of tang, from sweet and mild to hot and spicy. With a tang for every taste, the on-pack Tang-o-meter will help pick the right product for you; look out for this in stores! Visit our range page to learn more about our products. Look out for the Tang-o-meter on our new jars!